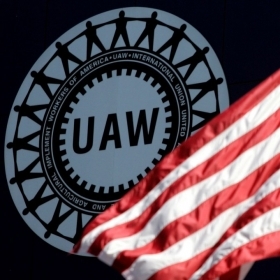 DETROIT -- The UAW has negotiated a landmark local labor agreement with General Motors Co. that should allow the automaker for the first time to produce a subcompact car profitably in the United States. The agreement calls for just 60 percent of all hourly workers at GM's assembly plant in Orion Township, Mich. -- where the Chevrolet Aveo will go into production next year -- to receive traditional production wages of $28 an hour with full benefits, said Mike Dunn, shop chairman for UAW Local 5960. The other 40 percent will receive a so-called Tier 2 wage equal to roughly half that of so-called legacy workers. Effectively, that means about 900 of the 1,200 to 1,500 workers on layoff at the plant will be able to return at full wages and benefits, Dunn said. The remaining workers on layoff will have the option of coming back with Tier 2 wages and full benefits or seeking a transfer to another GM plant, he said. GM built mid-sized cars at the Orion plant until last fall, when it was idled to retool for the Aveo. The wage agreement is expected to reduce GM's labor costs enough that the automaker can make a profit on the small car, Dunn said. “It's an integral part of the plan,” he said. GM and UAW officials reached a final agreement late last week, and plant workers were briefed on the plan Sunday. GM spokeswoman Kimberly Carpenter confirmed today that an agreement is in place but would not talk about the details. "GM has worked closely with the UAW to create new and innovative contractual language that will allow this facility to be flexible and lean -- essential elements in this highly competitive small-car market segment," Carpenter said in a statement. Traditionally, subcompacts have been assembled outside of the United States using lower-wage workers because companies could not build them in this country and sell them at a profit. Ford Motor Co., for example, is manufacturing its new Ford Fiesta subcompact in Mexico for the North American market. Detroit's automakers have had limited success hiring Tier 2 workers at U.S. plants, even though UAW contracts negotiated in 2007 and again in 2009 gave them the right to do so. Under those recent pacts, up to 20 percent of an automaker's hourly work force could be subject to the lower-cost Tier 2 wage scale. But because of the sharp decline in industry sales, along with numerous plant closings, Detroit automakers have been unable to hire new workers at lower wages. At the same time, many longtime UAW workers have been reluctant to retire or accept voluntary buyouts to create additional openings. But the Orion plant has been a special case. The UAW's 2009 amended contract with GM just before bankruptcy called for “innovative labor agreement provisions” that would allow GM to make a small car profitably in the United States. Workers at Orion Township will not have an opportunity to ratify the new agreement, Dunn said. They effectively agreed to the terms when the majority of UAW-represented workers ratified the 2009 GM contract that contained the general language related to a small car, he said. The Aveo is scheduled to begin production in 2011 as a 2012 model, Carpenter said. GM produces the current generation of the Aveo in South Korea, she said. GM will begin producing the new Aveo in South Korea in early 2011 before Orion Township gets the global car later in the year.